I’d like to reblog this because we are under constant pressure to reduce the time we spend teaching a particular subject. The 15 minute forum tonight was led by yours truly. As Y11 begin the final countdown from mock exams to the their final exams in the summer, Andy Tharby and I have been reviewing the resources and guidance that we give them, to support their revision. Over the years this has accumulated into a large booklet full of revision ‘advice’. The problem is that this booklet has become far too big and contains too many techniques and so ends up adding to their confusion! Furthermore, many of the techniques are questionable. So, we looked to the paper above (download here) to gain some clarity. 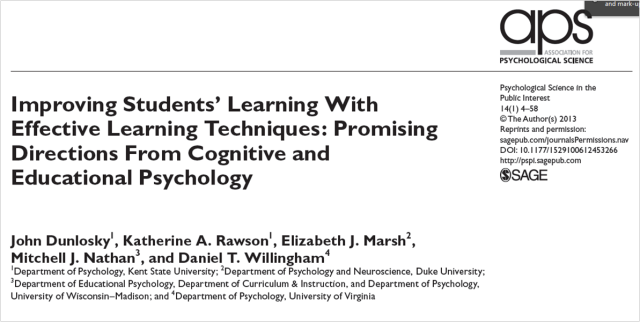 In the paper, Dunlosky et al identify the most effective techniques to support learning, that could be used for revision. Before this though, they also identify some common revision techniques that have been shown to have very little effect on learning. The tagline of this blog is “In Search For Reality” and I have just found a book with the same objective! Amanda Gefter’s book “Trespassing Einstein’s Lawn” is a delight to read. Very deep and insightful at the same time that is entertaining. For more information about the book click here. The question: What is real? Becomes parallel to the question: What is nothing? as just previous to the beginning of reality, the beginning of the Universe there was nothing! So how come something came out of nothing? There are so many more questions related to these stated questions so it looks like we are set for a long conversation. A conversation that has been going on for centuries. Within our Western Culture the conversation started to be articulated during the classic Greek period and has continued in both science (physics) and philosophy. Physicists and Philosophers in constant trespassing of the other field. In fact one can see the fundaments of Natural Philosophy in the merging of these. But more often than not a metaphysical reality is brought to the conversation. Reality is subjective! So what, then, is an objective reality, if according to quantum mechanics is all about probability?